The more the merrier as they say. We’ve heard you and we’ve now made it easier to add more data to your dashboard. If you have multiple teams, or use multiple boards within a single team, tracking one board or project won’t give you the full picture of where your development is heading. You need to track them all. You can now easily add more data sources to your existing dashboards by selecting Add new data source from the quick add menu. When you select it, a window opens that allows you to choose from the sources that you have already added to your dashboard. Once you click Save and return to dashboard, you’ll be forwarded to the same screen from where you started the process, and you can see that the new source is added to that screen. Previously, when you created a new dashboard, you got one month of data history. We’ve now increased that to three months. 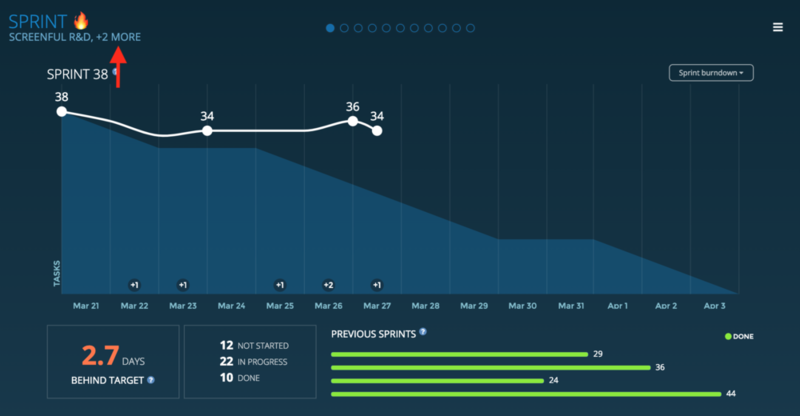 So when you create a new dashboard, your charts can show data up to three months in the past. When you hover the mouse over the spinner icons, a modal opens showing the status of the data loading process. From this modal you can see the status of data update of each data source. The ones that have already been loaded are shown in green. The ones currently in progress are shown in white. If there is a problem loading a data source, you’ll see it in red here. The icon disappears once all data sources are loaded and you charts are updated with fresh data. While the loading is in progress you can use all the features in your dashboard and you can freely ignore the spinner. But in case you really want to know whether your data is up to date, you can take a peek by hovering your mouse over the spinner. Have you already tried our free Epic Cards Power-Up? We recently released a new version of our Epic Cards Power-Up. It’s a free add-on for Trello that gives you the power to manage and track work on a high level across multiple boards. We completely redesigned how it works under the hood. Previously all epics were shared by all the boards that had the Power-Up enabled. Now you can specify whether to keep your epics local to this board, or to share them with other boards. That means that you can have two kinds of epics in your boards at the same time - those that are local to a board, and those that are shared across boards. Read all about these changes in this blog post. It’s a stand-alone add-on that runs entirely on Trello’s infrastructure. Your data is not sent on 3rd party server. We aim to keep it free for the foreseeable future (after all, it’s just a single feature). So go ahead and give it a try on your Trello board! That’s it for this release. We want to thank you for reading it this far 🙏 Stay tuned as we have some really cool features in the pipeline that we will be releasing later this year!